I ignored the YA section of the bookstore for most of my life, believing those books were strictly for teens. That prejudice ended with the Harry Potter phenomenon. I know, I know. HP isn’t quite YA, but stick with me. Suddenly, grown-ups everywhere were seen reading HP novels in coffee shops, on airplanes, and at beaches. Whatever stigma had been associated with adults reading children’s books disappeared overnight. I happily joined this movement, as did millions of others. With my resistance broken down, I didn’t think twice about trying a couple young adult novels I’d been hearing about. I bought, read and endlessly recommended both Little Brother by Cory Doctorow and Twilight by you know who. It wasn’t long before I started to prefer YA. Why do these YA stories resonate with me, a grown man, several rings out from the bullseye of the target market age? I believe it’s because authors don’t write these books for teens; they write them about teens. The condition of being a teen is one of in-between-ness: between childhood and adulthood, between dependence and independence, innocence and worldliness. If you’re a teen, the adults in your life don’t quite view you as an equal, and yet you no longer identify with children. You’re stuck. The struggle to get out of the the in-between-ness causes endless angst. It’s amidst this glorious angst that some of the juiciest stories happen. Here’s my theory: YA stories are myths about the journey teens must take to reach adulthood. Teens love these stories because they see their own struggles in them. But if you accept my theory, YA stories are as much about adulthood as they are about teenagerhood. And that’s why they appeal to adults. Maybe these stories provide some wish fulfillment, like an opportunity to relive one’s teens and make different choices. Or maybe the appeal is that adults feel some paternal or maternal instinct toward the young characters. In my opinion, all that distinguishes an adult from a teen is the collected sediment of years. If you scrape away the layers of cynicism and world-weariness, many adults are still teens at heart. I know I still struggle with authority, with the opinions of my peers, and I suffer continued disillusionment as one more thing I was certain was true turns out to be false. So why I do I read YA? It’s because, despite the fact I’m in my fourth decade, I’m still making the transition from childhood to adulthood. P.S. And that might also be the reason I write YA. Thank you Eric for joining us on the blog today! 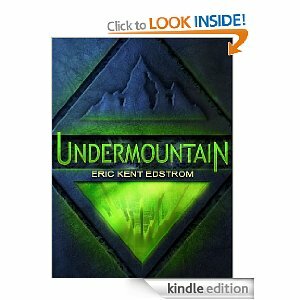 Eric Edstrom is the author of Undermountain, released in December 2011. Undermountain is an innovative, clever and wildly imaginative adventure. Along the way, Edstrom turns the legend of bigfoot on its head. A group of troubled teens escape to the Canadian Rockies for a ten day excursion. All they take with them is their backpacks and their grizzled old mountaineer guide. But when Danny and Breyona encounter a creature of legend—an eight foot tall beast they tag as “bigfoot”—the hike turns into a race for their lives.Swept to the secret city of Undermountain, Danny, Breyona and their friends find themselves in the middle of a war—between their “bigfoot” captors and horrific creatures called “shriekers.” But more than their freedom is at stake. To escape, to survive, to save the Earth, Danny and Breyona must end the war … and make sure neither side wins.